Spoonflower is working to expand the range of fabric it offers. 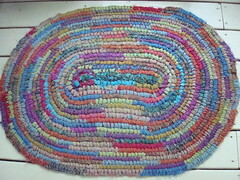 42 inches (with 1-2 inches of unprinted selvage). printable width of 40 inches (1-2 inches of unprinted selvage). It is our intention to offer additional fabric choices in the near future, including organic cotton. If you'd like to weigh in on what kinds of fabric you would most like to see, please drop Kim a line. The good news is that sometime tomorrow (Friday) when you visit Spoonflower you will see the new home page of our beta site. Hurray! [We owe particular thanks for getting the machine up and running to a talented fellow named Clinton.] That’s really good news. The bad news, however, is a real downer. Even for those of you who have signed up for the beta (and thank you, thank you, thank you for doing that), until you receive an email from us containing a password for your account, you won’t be able to register or login to the new site. That’s frustrating, I know. It’s going to take us a bit of time to scale up our production capacity just to meet the demand from the beta group. While this bodes well for Spoonflower’s future plans, it is going to mean asking many of our merry band of crafters to be patient for a while. In the meantime I’m going to try to flesh out the FAQ section over the next few days to help answer some of the detailed questions that many of you have emailed. We’ll have a new blog tomorrow as well, by the way. All of the old blog content will carry over with the sole disadvantage being that you’ll no longer be able to tell which of the past posts were mine (Stephen) or my wife’s (Kim). If it had anything to do with crafting, pretty safe to assume it was Kim. 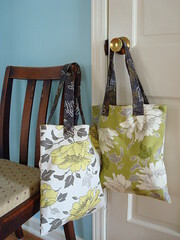 Thanks, Rebecca, for the link to a great tutorial on how to make repeat patterns. Written by guest blogger Julia Rothman for design sponge, this could be the perfect one-stop lesson on how to tile a design so that you don’t end up with bizarre, empty seam lines on your custom printed fabric. When I was in college I worked in a vintage clothing shop. I loved to work my shifts surrounded by gorgeous old dresses, hand-embroidered textiles, and collectible bric-a-brac. I would sometimes imagine who might have worn a particularly lovely frock, whose hands might have made all those tiny stitches bordering a linen tablecloth, and how all these things survived more or less intact and ended up there. If this is part of why you sew, you’ll want to read this pdf article on how various fusible and adhesive sewing products hold up over time. It’s a technical article and I’m sorry about the formating, but it’s well worth getting through if you use fusible web, fusible batting, quilt basting spray and the like in your sewing projects. If you’re like me and you’d like your quilts and embroideries to hold up through a generation or two for your grandkids to ogle, then it looks like our options are limited. I guess sometimes the old ways of hand-basting and flannel reinforcement are best. And here’s to hoping that our beautiful works don’t end up in a random shop someday, presided over by a clueless college girl! Woo-hoo! As I mentioned the last time I posted, I’ve been very inspired…hmmm, make that obsessed now, by Lotta Jandsdotter’s Lotta Prints. Finally, finally, over the weekend I managed to get some potatoes carved so that my 3-year old daughter and I could do some printing together. Success! Permanent fabric paint is a little scary around a toddler, but on the other hand it’s just clothes she’d be ruining, right? And I’m trying to be better about letting my kids have access to "the good stuff," as Soulemama talks about in The Creative Family. Yeah, another book I’m obsessed with. The large navy blue starry shapes are actually made from quilter’s template plastic I had lying around, but the rest are spud-based. I kinda like the two ovals stamped on top of one another best, I think. 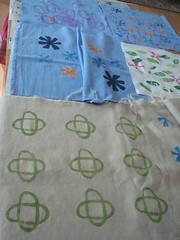 It should take me only a mere five more days to hem them all into tea towels!